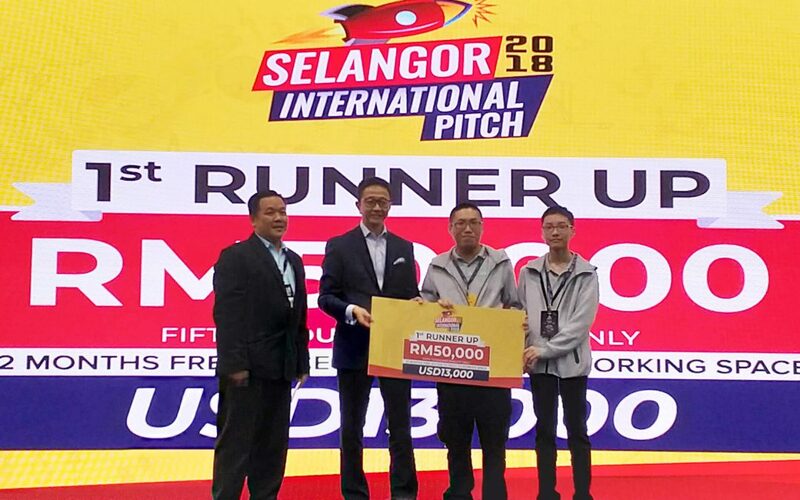 We are proud to announce that we came home with a cool cash prize of USD13,000 (RM50,000) at the Selangor International Pitch on Friday, 14 September. The Selangor International Pitch was part of the Selangor Smart City & Digital Economy Convention 2018, held at the Malaysia International Trade and Exhibition Centre (MITEC), which was co-organized by Selangor Information Technology & E-Commerce Council (SITEC), Menteri Besar Incorporated Selangor (MBI), Smart Selangor Delivery Unit (SSDU), and Invest Selangor Berhad. Selangor International Pitch is an international pitching competition that brings together Asia Pacific’s leading startups for a live on-stage battle. Over 100 startups submission, only top 30 startups will be preselected to present in front of distinguished investor panels, influential media, global partners and front of thousands of attendees on Centre Stage and be crowned winner with cash price up to RM100k. We were up against a highly competitive lineup of 29 other startups from the Asia Pacific region, such as Taiwan, Korea, China, Thailand, Singapore as well as Malaysia. Not to mention, highly qualified and experience judges of various backgrounds. Coming in at second place between two Taiwan-based startups. What’s next for the BAWA Cane team? We are proud and grateful to be one of the winners of the 2018 Selangor International Pitch. The BAWA Cane Team’s mission is to revolutionize the way visually impaired could better perceive their environment by empowering them with technological support is one step closer in light of this achievement. This will go a long way in helping us take the necessary steps to empower millions with our technology that may change blind and visually impaired mobility and access to get what they want to achieve. We are invited to speak at Naidex, Europe’s largest and most establish event for the disability sector on March 26 and 27 next year in Birmingham, UK. Get your free tickets here. We are exhibiting at stand N5112. See you there! For more such articles and to be part of our community, subscribe to our mailing list and we will be in touch with you.